Arutz Sheva visits the Land of Israel Network's new Biblical Farm education center in the heart of Judea. As Trump lands in Israel next week, Jewish residents of Judea will be celebrating the 50th anniversary of the area’s liberation with a historic inauguration. “As far as settlements, I’d like to see you hold back on settlements for a little bit” President Trump said to Prime Minister Binyamin Netanyahu in a press conference in Washington this past February. If this is still President Trump’s position, he may be surprised to arrive in Israel just hours before a historic building inauguration in the heart of Judea. Rabbis Ari Abramowitz and Jeremy Gimpel will be hosting an internationally live-streamed mega-celebration of the 50th anniversary of the Jewish return to Judea, the first day of the Six Day War, Sunday May 21st, the 25th of Iyar. “We chose this date to inaugurate our international headquarters in the hills of Judea because the 50th year is not only a historic milestone, but a spiritual one,” said Rabbi Gimpel. “On the Jubilee year, a shofar is blasted declaring freedom throughout the Land. This Sunday night we will be sounding the shofar declaring one powerful truth – Jews will live in freedom in Judea. “While we hope that President Trump acts with courage and moral clarity by affirming Jewish autonomy in Judea and Samaria – we are here to say that the Jews have returned to Judea and we are here to stay, regardless of what he or any other leader may have to say about it,” Abramowitz asserted. 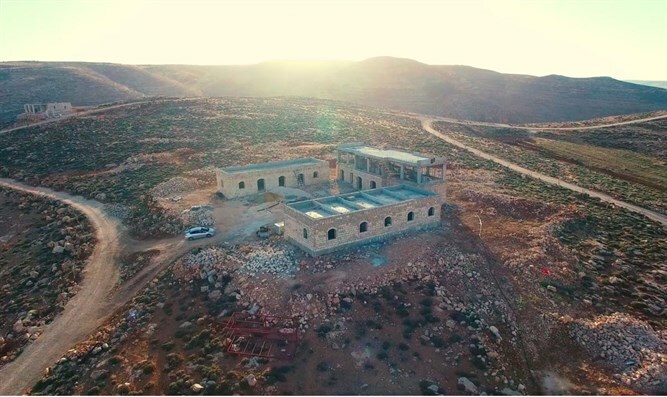 The soon-to-be inaugurated Land of Israel Headquarters is a castle-like fortification in the mountains of Judea that you would need to see to believe. Sharply contrasted by the surrounding caravan communities, their headquarters is built of the very Judean stones upon which it stands. “We are sending a message that the age of rickety caravans has come to an end. Our meter thick Judean stone walls reflect the eternal roots with which we are connected to this land. As Trump visits Masada, a Jewish fortification 2,000 years old, our Center will stand for at least 2,000 years to come.” Gimpel asserted while gazing from the building's window at Masada in the distance. The Land of Israel Headquarters is situated in the most contested area in eastern Gush Etzion, south of Bethlehem and Jerusalem. With a breathtaking view of the expanse of the Judean Desert all the way to the Dead Sea, the nature of the center differs depending on whom you ask. “While I see it as a “Judean embassy” type of building, projecting a message of Jewish identity and nationhood, Jeremy sees it as Yeshivat Shem Va’ever resurrected – referring to the ancient Biblical yeshiva for the world.” Abramowitz shared. While the primary function may still be coming together, one thing is for certain – it will continue on the same mission of spiritual advocacy that the two rabbis have been dedicated for nearly two decades. Having met as soldier and commander in the IDF, Abramowitz and Gimpel have spent the last fifteen years dedicated to their unique brand of “spiritual advocacy” in which they project the “truth and beauty of Israel to the world”. “This is more than a building. It’s an idea. And we’ve put everything we have into this because it’s an idea whose time has come,” Abramowitz explained.